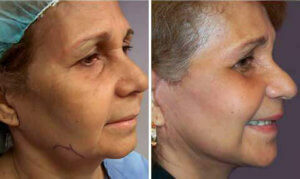 She is a 72 yr old woman whom underwent upper and lower eyelid surgery as well as a secondary facelift. I like the refreshed appearance she exhibits. 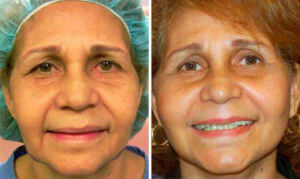 This is a 60 year old woman who has a striking asymmetry of her eyes and eyebrows as well as facial aging. An endoscopic Brow Lift with a Face and Neck Lift helped to even her eyebrows, tightening her neck and refresh her in a totally natural way. The AFTER photos are 5 years later, so you can appreciate the long term results. This is a 58 year old woman who underwent a minimal incision face and neck lift. You can see the happiness in her face AFTER.